Best Pressure Washer Surface Cleaners - Can a pressure washer surface cleaner remove surface stains? Battery Asking » Cleaning » Best Pressure Washer Surface Cleaners – Can a pressure washer surface cleaner remove surface stains? Best Pressure Washer Surface Cleaners – Can a pressure washer surface cleaner remove surface stains? Are you tired of hand-washing your driveway using a broom scrubber or any other means with no good results? Are you are wondering whether there is a better and easier way to do it? Yes, the best pressure washer surface cleaner is the solution to such a dilemma. When you use scrubbers and those harsh chemicals, will not only expose you to various health issues such as skin and respiratory but also take you ages to complete a simple task. You can use the force of water with nothing else to simplify what you knew to be a tough cleaning task and suddenly scrub your surface in a jiffy. Using a pressure washer surface cleaner, you will remove grit and grime and also restore the newness to your surface. But what is the best pressure washer surface cleaner I can use? You wonder! You don’t have to worry yourself with such thoughts. We have lifted your burden to present to you the best eight pressure washer surface cleaners in the market after a thorough search. Read on to find your best choice. Q: Are pressure washer surface cleaners the best alternative for surface cleaning? Q: Should I use detergent with my surface cleaner? Q: What are the color codes for the nozzles in a surface cleaner? Q: Is it true that surface cleaners conserve water usage better than pressure washers? What about you, which is your best pick? PowerFit which has two rotating nozzle jets with the speed of 1,500 RMP can fit in almost any 1/4 inch pressure washer wand of up to 3300 PSI with ease. It takes no time to connect and start working and therefore taking less time than most surface cleaners. It has a cleaning path of 15 inches wide which makes it powerful and efficient to clean four-times faster than any standard spray. The powerful dual jets that rotate to clean will make sure to deal with all kinds of dirt and thus leave your surface spotlessly clean. PowerFit pressure washer surface cleaner will, therefore, meet your quality demand at an affordable price. The outer casing is sturdily made of ABS plastic material, but some parts are compromised such as the nylon bearing which can wear out and fail to get a replacement. One user contributed the fact that lubricating the pressure washer’s spray head is essential to increase its efficiency. Other than that, PowerFit is an excellent pressure washer surface cleaner to have among your cleaning tools. If you need to clean a more extensive area within no time, then Yamaha ACC is the pressure washer surface cleaner that you need. The cleaner is heavy enough to hold down for effective cleaning. While gliding on the floor and using its rotating nozzles, it will leave your surface streak-free clean. It has a cleaning path of 15 inches making it four-times faster cleaner above other standard ones. It does maximum cleaning without skipping some areas and not even where there is a depression on the surface. It reaches all parts with the aid of its nylon bristle brushes. Also, with the spray lifting the cleaner, pushing and pulling it is therefore easy without using more effort. You can attach it to almost all of gas-powered pressure washers that have up to 3300 PSI easily and quickly. However, it does not reach at the edges well enough, and therefore you might need to use a direct spray for such areas. After finishing cleaning using Yamaha ACC, it will leave you with polished-like floor different from what you have ever known. Are you running out time to clean your driveway that can’t wait another day to clean? Karcher is the pressure washer surface cleaner that will help you out of the tight situation. Karcher covers a cleaning path of 15-inches, and it is compatible with gas-powered washer brands of up to 3200 PSI and with a connection of 1/4-inches fitting which is easy to connect. It has a skirt around it to prevent splashing when working with it. The cleaner uses two high performing spinning nozzles that maintain their height to ensure maximum streak-free cleaning. Therefore do away with any of those other cleaners to restore your surface to its original appearance. It does not only clean horizontal surfaces, but also vertical ones such as walls, doors, and home siding. However, keep on checking the nuts to tighten the two nozzles to keep on working efficiently. It has flaw quality which if unchecked can easily breakdown. If you are out there looking for an easy to work with surface cleaner, then The EZ Clean will be your best choice. It works with pressures washers the PSI between 2,300 and 3,300. It works evenly on all parts of the surface to give consistency results in your cleaning. It plugs quickly and efficiently to 1/4-inch fitting. EZ Clean has powerful dual nozzles that release pressured water to remove every bit of grit and grime whether from algae or mold. It will leave your surface whether concrete or of wood looking spotlessly and polished-like clean. EZ works best with gas and electric powered washers. It can remove the patina on most wood surfaces without using much force or effort. The surface cleaner works efficiently in cleaning all the grime and dirt. But, it fails to remove the washed out dirt from the clean area and therefore becomes hard to differentiate the clean surface and the unclean one. Greasing the trunk and the washers frequently will prolong the life of the surface cleaner. Karcher T300 is the surface cleaner you could be looking for if you need to clean a large surface with ease and in less time. Even though it is slightly low on its cleaning path doing 11-inches diameter, it makes up with its quick operation. One unique feature with Karcher T300 is that it has a dial that switches pressure levels and also has a 32-inch wand extension. These two features give it an upper hand above other competition surface cleaners to enable it to tackle tough cleaning. The 32-inch extension wand has locking joints that lock vertically and also can detach into two pieces for ease of storage. The quick and effective tough cleaning is enabled by two spinning nozzles that jet out water in the right pressure to gouge out old dirt and grime and clean it out. Its consistency cleaning does not leave any streaks but results to evenly spotlessly clean surface. Whatever the surface it might be, whether driveway, pathway, patio or deck, Karcher T300 the household name in cleaning services will clean effectively any of it in the least time possible. 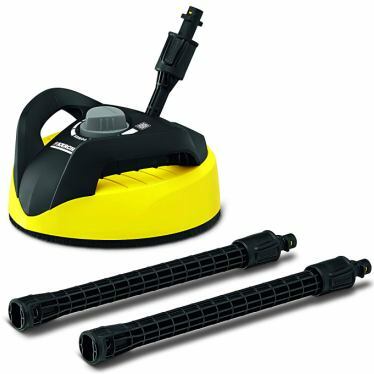 Karcher T300 does not work with all Karcher brands models which are K1700 cube, K1700 to K2000. Otherwise, if you have a brand that is compatible with it, then it will work best for you. 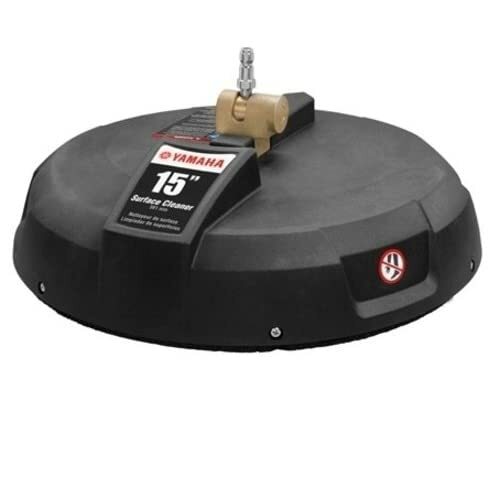 Simpson 15-inch surface cleaner is a unique cleaner that is almost universal to work with most gas-powered pressure washers. This surface cleaner is a sturdy one made of steel which is powder coated to prevent rusting. With a diameter path of 15-inch, Simpson can take a very short while to complete a big cleaning task by working five-times more than standard nozzles. The stainless steel dual rotating nozzles that can handle 3600 PSI have enough pressure to wipe out every kind of dirt from your surface. Simpson surface clean is the best choice if you need a sturdy surface cleaner that is durable to last you a very long time. It is ideal for cleaning sidewalks, driveways, patios, garage floors, decks, and other surfaces. However, it does not include a wand, and therefore you will have to buy it separately and thus to incur an extra cost and time. If you are looking for a surface cleaner to clean your concrete sidewalk which has taken years to clean and therefore collected all kinds of dirt and grit including algae and mold, Generac should be your choice. It is constructed using durable plastic, heavy-duty brass, and stainless steel. All the material is non-corrosive which assures you of a durability surface cleaner. Generic 6132 is meant to clean concrete driveways, sidewalk, and other concrete-hard surfaces. It glides and works faster than any other standard spray nozzle due to a full 15-inch path clearing a large area within a short time. It is a two-in-one surface cleaner using its high performance and fast rotating dual nozzles that move consistently. There is no dirt or grime no matter how old can withstand their downward pressure force. The sturdy, flexible bristles are the other part that controls over and hard spraying to your surface for protection. Generac 6132 is a versatile surface washer with a quick-change and an adjustable connector that can work with most of the pressure washers up to 3100 psi. One thing you should check carefully is the plastic nut that holds the assembly together which sometimes becomes loose. Make sure to tighten it at the top to avoid the nozzles grinding on the ground. Do you require a surface cleaner that can ultimately clean your patio or deck while caring not to ruin other objects such as wall or flower beds with dirty splattering water? Ultimate Washer UWSC15B should be the right choice. It features 25-degrees nozzles that spin with the speed of water pressure for optimal scrubbing of the surface to remove all grime. There is no doubt about its four-times fast working due to its 15-inch path coverage. The brush skirting protects over-spraying and contains water inside its round dome to protect not only you but also items that can be ruined by the dirty water. You would hate to see your delicate flowers destroyed by the high sprays of dirty water. The Ultimate Washer is constructed to connect easily and quickly most pressure washer brands that can fit its 1/4-inch inlet connection. Your wand will snap in to close and get on with your cleaning without time wastage in fumbling with it. It is compatible with most high-pressure washers within 3100 psi and 4 GPM for the nozzles ease of operation. One flaw with the unit is the plastic nut at the top that attaches the wand can lose its hold by the worn out thread to cause an imbalance to the cleaner. You might need to upgrade it with a metal nut that is sturdy and durable. Apart from that flaw, the surface cleaner is the one you would not want to miss. Yes, this is the best alternative in the market so far. There are fast and do thorough cleaning especially to driveways and pathways where it is most dirty. Again, it can handle large areas with ease, unlike other methods. Yes, you can use a detergent that you are sure its ingredient and can work better with your surface. While cleaning vinyl surfaces, you should be careful with what you intend to use and whether it is the right detergent that cannot cause damage. Moreover, the water pressure of the surface cleaner can still work better without the use of detergent to even remove stains on the surface. Again, check also whether your unit is compatible to use detergents. High chemical detergents can damage some parts. You should consult your instruction manual to understand more which nozzle will work best on your surface. Since a surface cleaner uses two high rotating nozzle jets to dispense water and cleaning, it will cover a larger area within a short time compared to a pressure washer. It is therefore logical that it will use less water. All the units in this review are the best to use for pressure washer surface cleaning, and we can vouch for each considering their features and effective cleaning. However, one or two factors would make one unit to stand out from the rest and therefore become more favored as the top best. For that reason, our top pick is PowerFit PF31023B Surface Cleaner. It has high performing twin nozzles which clean fast and effectively. Moreover, it is the best in price comparing to others with the same performance. Please leave us your comments on why you have made that selection. Your insight is not only useful to us but to other users as well.